Our modular teaching style allows you to pick and chose the classes that fit your schedule and progress at your own pace. We recommend starting at the The Intro to Kayak clinic for a solid foundation, and mastery of the basic skills in flatwater. 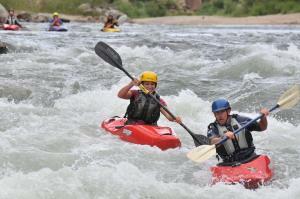 The Kayak Roll is a great next step, although not a requirement for the Intro to Whitewater. Each class builds on the foundation and introduces new sets of skills in more challenging conditions. Classes are taught in Albuquerque, Santa Fe, Los Alamos and various locations throughout New Mexico and Colorado.